This post is part of a #5post5days challenge issued by Carlo Fusco. Please take time to read the other blogs, and join in! Five posts in five days is not the same as one per day, and you can start any time! 1/5 posts available here. In this series of posts, I am thinking about what is in our heads when we use language specific to education. Yesterday, I tackled our ideas of school, images that are often locked in a world that existed when we were there every day as children. How does our language limit our thinking and our ability to move forward in education so that our children are not experiencing such a disconnect between their lives in and out of school? Blended Learning is a more recent buzz phrase that has been defined in Ontario to mean everything from “using the provincial LMS in a f2f class” to “combining digital media with traditional classroom presence”. Usually this is with the purpose of giving students some flexibility with regard to the time and place they “do their work”. But are we just doing traditional things online? Is using the dropbox to organize and secure student assignments so we can check “upload dates” against due dates, and so we can use an online originality checker, really moving forward? Aaron Burden on Unsplash. Image is linked to original. Alan November. Image is linked to original post. If blended learning is just a place to post news items and gather assignments, are we really transforming our teaching practice? Watch here for links to other 2/5 Day 2 posts. 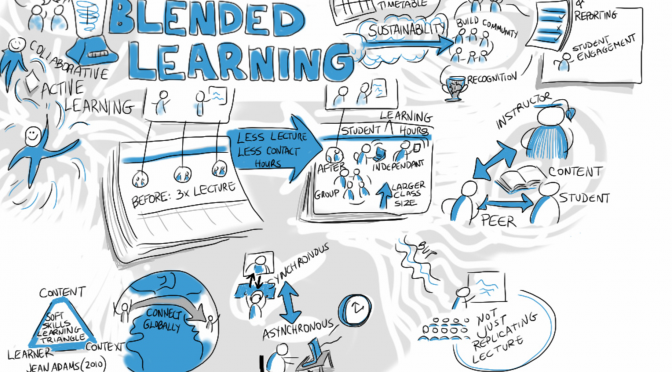 The blended classroom is one of the greatest places to explore methods to transform education. Some of the most innovative things I have seen have been from blended classrooms. It is these teachers that have embraced SAMR and are really looking at the MR of the model.